Mobile computer carts are a great way to create portable workstations in a pinch. Whether you are in the home or the office, a laptop or computer desk cart can be an ergonomic and space-saving solution. These computer carts come with locking caster wheels, allowing you to secure it into place, without having to worry about your iMac getting jolted off the tabletop. Many buyers enjoy moving their computer cart workstations throughout their homes, even tucking it away in a closet for the evening to add more space to their living quarters. Other buyers keep their computer carts fixed in one position, infrequently moving it, and mainly using it as a stand-up workstation in their homes or offices. Whether you prefer something minimal, like the Seville Classics laptop cart, or a more robust and rugged option like the Luxor steel utility cart, there are some interesting styles to choose from. Let's take a look at 5 of the best-selling computer carts on the market today and see how they compare. The 24”x16”x20.5” to 33”, 50 lb Seville Classics WEB162 Laptop Cart is a sturdy laptop stand that has a single central stem whose height can be quickly and easily adjusted. Its users love that it is easy to assemble, but also note that the bottom edges of the table are quite sharp, and may require some filing. It has 1.5” rolling wheels, two of which have locking mechanisms. Its large table top and tilted design allows for comfortable typing. This mobile laptop desk is a good option if you are looking for an affordable computer cart. Overall user feedback for the Seville Classics WEB162 Mobile Laptop Desk Cart is that the build and quality is great considering its price range. Many people who bought it agree that assembly is very easy, taking less than 10 minutes. Users also like that its 24” table top fits even large 17” laptops. However, there were some who commented that the lack of a retaining lip at the bottom of the slanted table top can be a problem for devices without grip. Some users worked around this by assembling the top in reverse to get a level plane. The multipurpose, height-adjustable Luxor Rolling AV Utility Cart is an excellent choice that is built to last and has a lifetime warranty. Its users love that this steel rolling cart has a well-designed, high-quality feel, but also comment on the difficulty in its assembly. Its roll formed shelves are powder coat paint finished and the tables are robotically welded. The shelves are 24” wide and 18” deep, with holes where cables can pass. Cart comes with a 3-outlet electrical assembly with a cord plug snap, and 4” ball bearing casters, two with locking brakes. This computer tray shelf is a good option if you are looking for a sturdy, well-built AV utility cart. Most of the customers who bought this rolling AV utility cart concur that it is very solidly built. Users also like the electrical outlet provided with a cord plug snap. One thing users found a little strange is that the instructions suggest dropping the assembled unit on a corner on a concrete surface several times to level it, but they are satisfied that it worked as instructed. Even though some of them found the assembly a bit of a challenge, they are generally happy with its strong construction that is meant to last a lifetime. The 29” tall, compactly-built Calico Designs 50100 computer cart is a great-looking desk that has a work surface made of tempered safety glass. Users who bought it are happy about its good build combined with nice looks, but also note that the wheels don’t roll as well on carpet. Its main work surface is 23” wide and 18.75” deep. It also features a metal sliding keyboard shelf and a spacious bottom shelf to hold the CPU and/or printer. This L-shaped workstation is a good option if you are looking for a computer cart with a unique contemporary design that is also space-saving. A lot of people who purchased this computer cart wanted something that fits in environments with limited space, and this seems to be an ideal choice for them. Users are also pleased about its good design and the ease with which it can be assembled, which can take only under 30 minutes. However, there were a number of users who wish that the caster wheels were built more sturdily and could move around more smoothly. But its price point, functionality, and the unique clear glass top make this computer table a very attractive option. 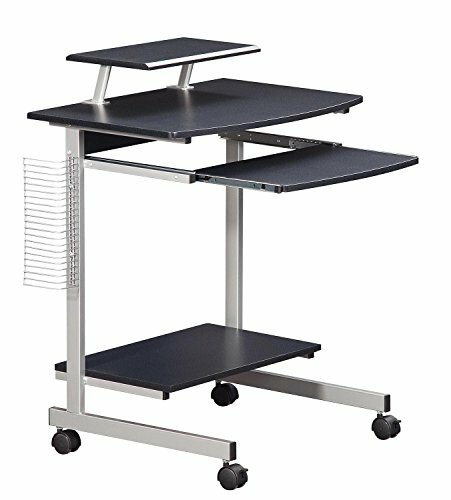 The space-saving, glass-topped Altra Furniture Mobile Computer Cart Desk is a great option that mixes modern and industrial styles together. Its users love that it is compact yet has enough space to hold everything. However, they also note that the keyboard tray can be quite stiff to push or pull. The small footprint of this desk makes it great for an apartment or dorm room. The 4 casters let you easily move the unit easily from one area to another. The surface is made of glass, allowing a clear view of the keyboard. This mobile desk is a solid option if you are looking for a good value computer workstation. Users of this mobile desk say that this is a nicely-built and sleekly designed product. The quick and easy assembly of the unit is also another positive characteristic of this computer desk. People who bought it are satisfied with its sturdiness and affordability. The major flaw of this item is the keyboard tray, which many users find hard to move. Another thing is the base, which can get in the way of your feet. One user said that this is not a big issue since you can just pull out the keyboard tray to give enough room to sit comfortably. Made of heavy-duty fiberboard panels and a powder-coated steel frame, the Techni Mobili Compact Computer Workstation is a nice option that features a unique elevated shelf that can be installed on the left, back, or right sides of the desk. Its users like that it is sturdy yet light, though a few think that the assembly instructions need some improvement. It has durable nylon wheels that lock for stability and, pull-out keyboard, and a CD rack on the side. It also comes with a 5-year limited warranty. This computer desk is an inexpensive option if you are looking for a space-saving complete workstation. People who bought this computer workstation are generally pleased that it is space-saving and easily rolled around when needed. They liked how the movable elevated shelf can be used to position the monitor, freeing the table top for other needs (e.g. handwriting, placing an open book, etc.). Assembly was relatively easy, although there were a few complaints on the drilled holes not being perfectly aligned. Users also liked that all the tools needed to assemble (a screwdriver and a small metal wrench) came with the package. The black and chrome stylish look also received positive remarks from the users. One of our favorite computer cart workstations is the Techni Mobili computer cart- it's a true heavy-duty option that includes a five-year limited warranty with many satisfied buyers. Reviewers particularly appreciated its inbuilt keyboard access, thoughtful inclusion of a side rack for media accessory storage, the spacious surface of the desktop that was ideal for storing printers, mice and monitors as a mobile solution as well as the large storage area on the bottom shelf. One buyer described using it for his iMac computer- saying that he wouldn't place such an expensive item on a wobbly surface, implying just how strong and secure this mobile computer workstation really is. He particularly appreciates that this computer cart makes him completely mobile- allowing him to navigate freely throughout the rooms of his house, so that he can work in the bedroom, living room and even into the kitchen without too much effort. Another reviewer says that this was a space-saving option, allowing them to create a convenient but 'small-footprint' work area that is the key to keeping organized and clean. Another buyer said that this computer desk cart is actually aesthetically pleasing- something they didn't expect when purchasing it for such a low price. They particularly enjoyed that the top shelf is completely maneuverable so that you can put it to either side, which was convenient when they wanted to switch up where they placed the speakers connected to their laptop on the cart. Another buyer describes using this mobile computer cart inside of his small Brooklyn, New York apartment, saying that he enjoys being able to push it into the closet when not in use to create more space in the evening when he has friends and family over. On the downside, while the assembly is pretty simple, the directions, as reported by many buyers, we're not overly clear. It will require some diligence- but with enough focus and time on your hands you should be able to assemble this in under an hour. A more minimalist option is the Seville Classics laptop desk cart. 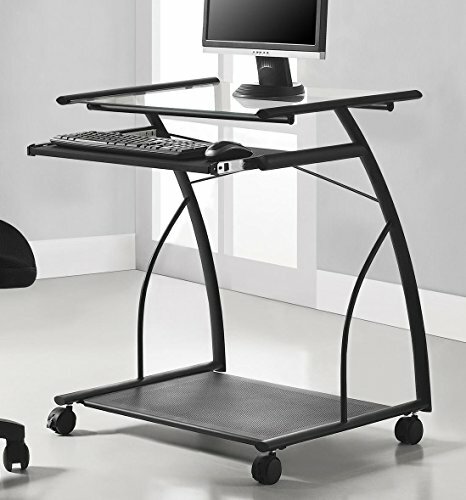 In essence, it is essentially a rolling cart with a height adjustable platform for you to place your laptop on. It really bills itself primarily as a laptop mobility solution as opposed to the Techni Mobili, Which has a lot more storage space areas. 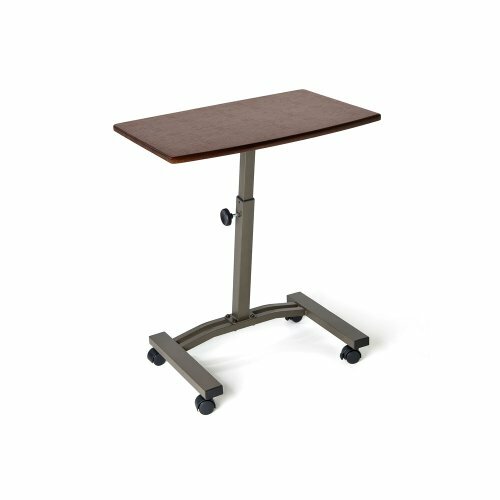 The Seville Classics features a large table top, a sturdy rolling base that can support up to 15 pounds, as well as manual height adjustability. One reviewer that we contacted said that he is highly satisfied with this laptop stand- saying that he uses it frequently at work. It rolls smoothly, doesn't wobble, and he likes that he can position it next to his chair or couch because of its ability to angularly lean towards his seated position. He says that while it may not be an ideal solution for people laying in bed, when an overbed table would be a better option, it is an excellent companion for those two want to sit at a desk or chair and use their laptop while recumbent. As well, though it lacks in some features, the tabletop surface is 24 inches wide, which lets you accommodate an extra large laptop- and because it is made from wood it has a really solid feel. Assembly wasn't a nightmare either- even though the instructions are pretty remedial, the included photographs helped to instruct assembly effectively. Another reviewer says that this laptop desk cart comes with four locking washers that are designed to be used on the base of this cart that functions as the stand's fulcrum. Yet another reviewer who purchased this mobile laptop cart says that he puts it through heavy use and can testify that the tabletop surface is, indeed, scratch resistant. He particularly likes that the top can be tilted up to 35°- and because most laptops are fitted with rubber feet, they don't slide off, although he has had a few objects that are not rubber-surfaced like books slide and often fall. One downside is that a purchaser cautioned about is that the bottom edges of this computer cart are actually pretty sharp- they went the extra mile and filed the edges down a bit before using to ensure they didn't scrape up their thighs or arms. 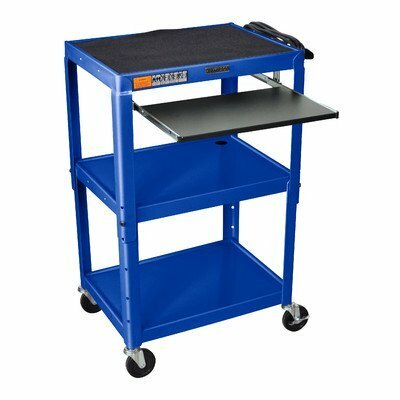 Yet another option that we examined is the Luxor steel computer cart- this is a particularly rugged and industrial option that comes in five different colors. Users like it's solid and functional build, it's smooth rolling operation, but found that the instructions and assembly were generally highly difficult. It is indeed a multi-purpose unit. 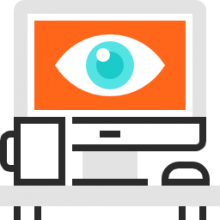 Users and as diverse fields as IT and audio recording described using it for a variety of different carting purposes, whether to just have a mobile computer workstation nearby, or hauling around different accessories necessary for their job purposes. Some users, however, have had problems in shipping, complaining that the card arrived damaged and missing parts. While a rugged option, the difficulty users had assembling it, in conjunction with many of the shipping complaints users expressed, makes this not a strong recommendation to buy. Purchasing a rolling computer cart can be a great way to save space in the home or in your business, even enabling you, depending on the model you select, to work from your sofa or armchair. Some of the options are fairly minimalistic, while others are more multi-functional-it's really up to your personal preference and how you envision using these computer carts that would be the ultimate buying criteria for you.